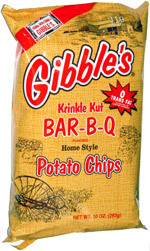 Taste test: These are pretty good barbecue chips, the rippling of the chip makes it hold more bbq powder than on a normal chip. The barbecue taste itself is kind of sweet, closer to sweet than spicy. The chip has a good solid crunch for those who like crunchy chips. Smell test: A barbecuey smell.